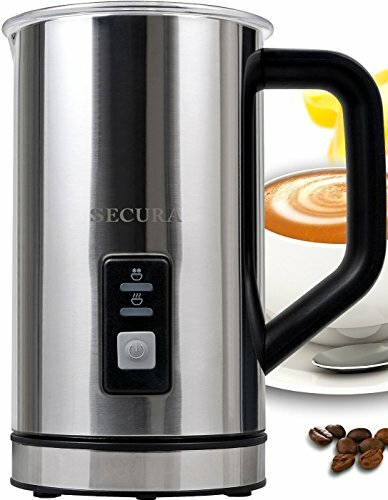 The Secura Automatic Milk Frother is a mid-priced element coffee maker that has the appearance of a ready-made pitcher, and does a pretty good job at setting you up with the froth you need for all types of drinks. One thing you will notice about this automatic milk frother right away is its capacity: It sits at 125 ml for milk froth preparation, and 250 ml for hot milk preparation. Makes hot and cold milk froth for cappuccino drinks, and also will heat hot milk for lattes. Maximum level indicator for milk frother and for milk warmer, and a minimum milk level indicator. Since we have had this for a while now, it’s a great time to review it. It’s been about three months, and it is hardly showing any signs at all of wear and tear. Many other models for the same price or just a bit cheaper will quickly need replacement parts, and the one we got from Amazon has held up quite well. All you have to do is pour in your milk and hit go, and so this one scores high points with us and with anyone who wants quality froth without having to wait for it. It’s not just the fact that its bigger and more sophisticated then a hand-held model, it really can do its job over and over again without much sign at all of wear and tear. For cleaning, the best results we saw were by taking the whisk out and running it under very hot water to get remaining residue and milk off. Then we used some soapy sponges to carefully rinse the inside. What really works best here is making sure you remove the whisk right away, to properly get rid of the mess. Using skim milk is what gave us the best results for the Secura automatic milk frother, we did try 1% and the results were still satisfactory, but skim gave us the kind of froth we were really wanting: creamy and tasty, with a bit of a thin quality to it. For about 8 ounces of milk, it took us around 40 seconds to heat it just right, and we obtained a thermometer to see what the temperature was and it was right around 140 degrees F. We did not try to froth half and half with it, but a friend of ours that has been a barista for many years said she is able to complete the job with the Secura automatic milk frother. 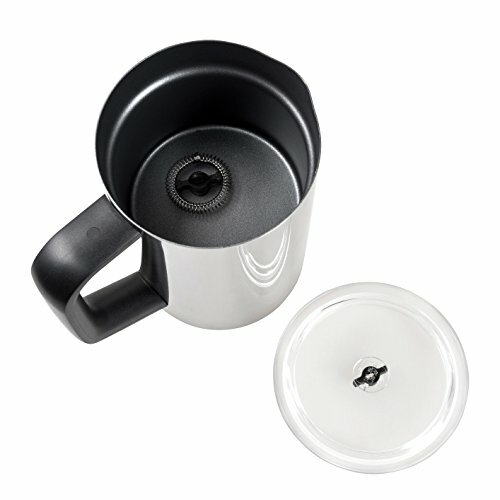 There is no type of filter needed with this device, and basically, you pour milk up to the appropriate fill line, and then make sure the top container is very secure. You simply push the button, and make sure that both the blue and red indicator lights are lit. The blue light goes off when your froth is done or the heating is completed, and when the red light begins flashing, it means the milk froth is prepared. If you are just frothing only, you push and hold the button for about 2-3 seconds, and then the blue light is on. After the red light begins flashing for around 30 seconds, the froth is ready for serving. While you were drinking your wonderfully steamed or cool beverage that will no doubt send you to the edge of wide-awake contentedness, you just need to wait about 2 or 3 minutes before making another with this well-chosen frothing machine. 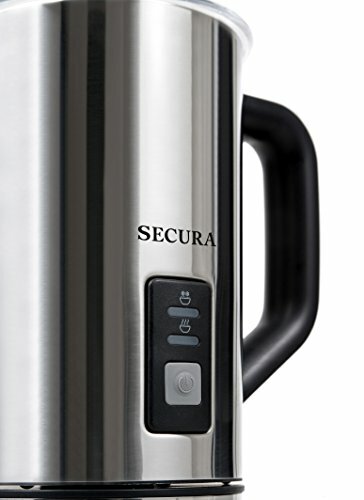 Our final nod on this one really has to go fully to the device and its potential: If anyone wants a milk frother that is entirely different, they probably just don’t like the “serving pitcher” appearance: the Secura automatic milk frother is one durable and good choice for the consumer products in the wake-up- and go realm. Otherwise check out our Ikea milk frother review.